November 12, 2015	| 6:00 p.m.
MICHAEL REISMAN is Myres S. McDougal Professor of International Law at the Yale Law School where he has been on the Faculty since 1965. He has been a visiting professor in Tokyo, Hong Kong, Berlin, Basel, Paris and Geneva. 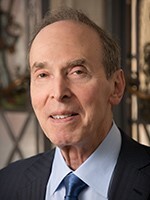 He is a Fellow of the World Academy of Art and Science and a former member of its Executive Council, a member of the Advisory Committee on International Law of the Department of State, President of the Arbitration Tribunal of the Bank for International Settlements and a member of the Board of The Foreign Policy Association. He has been elected to the Institut de Droit International and is Honorary Professor in City University of Hong Kong. He was President of the Inter-American Commission on Human Rights of the Organization of American States, Vice-President and Honorary Vice-President of the American Society of International Law, Editor-in-Chief of the American Journal of International Law and Vice-Chairman of the Policy Sciences Center, Inc. He has served as arbitrator and counsel in many international investment cases and was presiding arbitrator in the OSPAR arbitration (Ireland v. UK) and arbitrator in the Eritrea/Ethiopia Boundary Dispute and in the Abyei (Sudan) Boundary Dispute. Reception to Follow: Please join Professor Reisman for a brief reception to follow his remarks (in the same location: MC2-800). Please enter the World Bank through the main door (on H street, between 18th and 19th Streets) between the hours of 5:00pm and 6:30pm, to pass through World Bank security.